What is PostAdsDaily.com all about? How do I Post Free Ads Daily? How do I Post Premium Ads? How do I get Premium Advertising on this site? I cannot login to my account, what should I do? How can I make money from promoting PostAdsDaily.com? How do I use and redeem a 'Promo Code'? How do I make money with PostAdsDaily.com? I paid for advertising but it is not showing in my account? How do I keep up with what's new at PostAdsDaily.com? PostAdsDaily.com is your #1 site to post free and premium advertising daily. 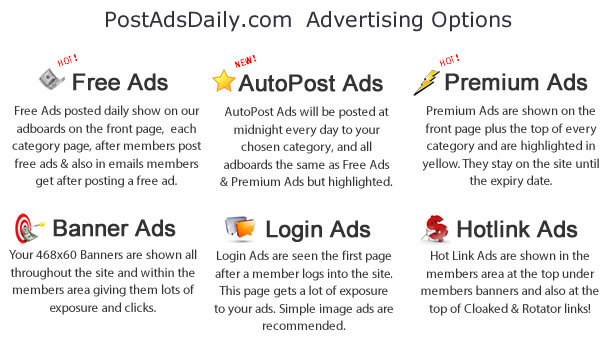 Our main feature for members is to Post Free Ads Daily in our category based adboard, although there are tons of premium advertising locations and other cool features for members. First you need to Signup for free and become a member. You will need to verify your email address by clicking the confirmation link in the email sent to you. You will be offered some great ad package deals as discounted prices, and then redirected to the login page where you login. In the members area, goto 'Post Ads Daily' to post you free ads every day! Once you have purchase your premium ads or received them as part of an offer, goto the Advertising section. Scroll down to the Premium Ads section then and you will see in red how many premium ads you have. Click on this link to setup your ads. After confirming your email address, you will be offered an awesome 'One Time Offer' giving you a massive advertising package, a Pro account plus a ton of additional bonuses you will love! Be sure to take advantage of this limited time offer. I cannot login to the members area, what should I do? Please goto the Forgot Password page and resend your password. Also, make sure you have confirmed your email address on signup. The system will automatically remove your account if not verified after 48 hours. If so, please signup again. Otherwise contact suppport for help. All members are instant affiliates. Login to the members area and goto the 'Affiliate Tools' section. You will find tons of banners and promotional tools to use. Post these links on other ad sites, in your emails, on your blogs and sites, and promote to your lists. To use a promo code, you need to login to your account and goto the 'Setup Advertising' section. You will see the section to redeem you promo code. Once entered, go back to the advertising section and setup the ads redeemed. Please contact admin with your payment receipt and your advertising will be added to your account as soon as possible. Recommended : Up To $3000 April Referral Contest is Running On MLM G.